"The Monterey County Gives! campaign provides a vehicle to inspire local philanthropy at all levels." People with disabilities, the elderly, people with chronic health conditions, etc., are exceptionally vulnerable during and after disasters. Our BIG IDEA is to recruit and support these individuals to participate in Community Emergency Response Training throughout Monterey County so they, and our communities, are better prepared for emergencies and disasters. CLICK HERE TO DONATE NOW! Your donation receives a prorated match. 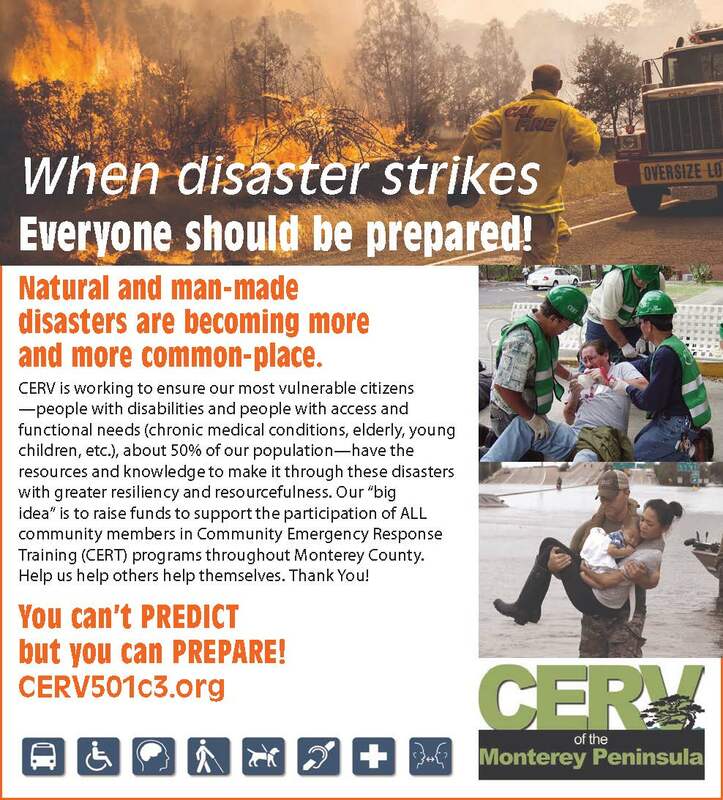 Monterey County CERT programs currently include few people with disabilities and thus lack their expertise as volunteer first responders, which can be invaluable in emergencies and disasters. Monterey County's Access and Functional Needs Working Group (members from CERV, Monterey County Office of Emergency Services, the Central Coast American Red Cross, the Central Coast Center for Independent Living (CCCIL), United Way, and the Community Foundation) have identified the lack of planning for these groups as an unmet need. The need for active participation by people with disabilities is essential to disaster readiness, response, relief and recovery. CERV is all about making communities more resilient.